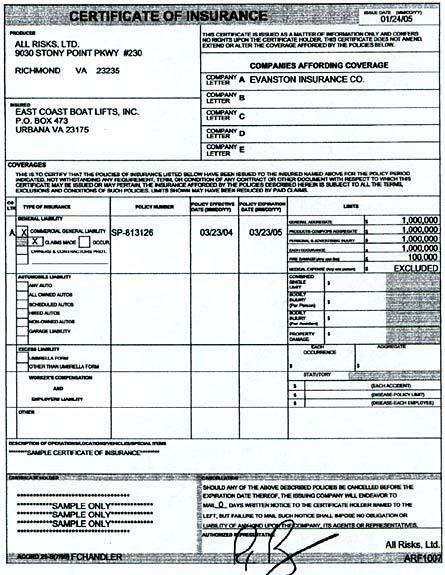 Seller (East Coast Boat Lifts, Inc.) warrants, to the original retail buyer only, each of its manufactured products that such products are free from defective materials and workmanship for a period of two (2) years from date of purchase by Buyer when purchased from seller or an authorized dealer of East Coast Boat Lifts, Inc. There is a five (5) year structural warranty on all four (4) piling lifts. This limited warranty shall not be effective, and shall be void, if the products are not installed or used under normal conditions as recommended by seller, when subjected to abuse, neglect, or carelessness, when altered or repaired by anyone not authorized by seller during the term of this limited warranty or if the product has been subjected to lift dead weight in excess of factory stated rating capacities. This limited warranty does not cover, and seller in no way warrants, any cables, hooks, shackles, radio controls or other parts or components manufactured by someone other than seller. Buyer shall establish its claim by returning the defective product to seller at 510 Lord Mott Road, Urbanna, VA 23175, transportation prepaid, within the period of this limited warranty. The return of a product must include proof of purchase, the make model, and the date on which the product was installed, the name of the party installing the product, and a statement in clear and concise terms setting forth the basis of the warranty claim. This limited warranty shall not include that cost of labor for the repair, replacement, removal or reinstallation of any product covered herein. Such costs shall be the sole responsibility of the buyer. At its option, seller may repair or replace the defective product. Repair or replaced products are warranted for the remaining portion of this original limited warranty period at the time the product was purchased by the buyer. This limited warranty shall not be valid except when delivered by an authorized representative of seller and buyer, shall not be entitled to rely on any other warranty or representation, whether same be oral or written, except as provided in this limited warranty. This warranty gives you specific legal rights and may also have other rights that may vary from state to state.